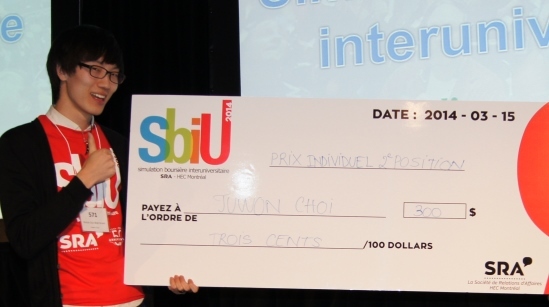 At the 17th edition of the HEC Montréal interuniversity trading simulation (SBIU) on March 15, bringing together over 450 finance and administration students from 12 Quebec universities, some of our BBA students turned in outstanding performances. 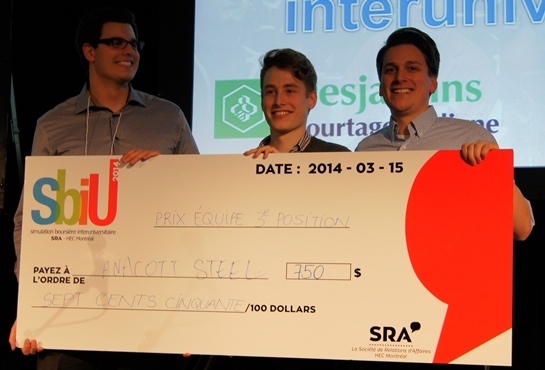 Pierre-Alexandre Gagnon Nadeau and Juwon Choi took first and second place as individuals, while Maxime Bertrand Gilbert, Louis-Simon Gingras, Louis-Simon Hubert and Jean-Félix Teasdale took third place as a team. The simulation, organized by the HEC Montréal Société de relations d'affaires (SRA), is designed to recreate trading in a financial market. 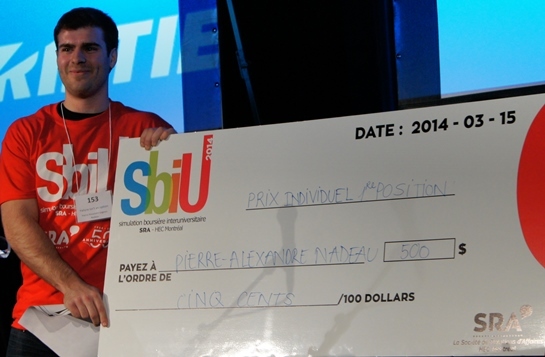 This year’s competitors had to manage a $1 million portfolio of fictitious securities. Louis-Simon Hubert, Jean-Félix Teasdale and Louis-Simon Gingras. Missing from the photo: Maxime Bertrand Gilbert.